Royal Navy and Army units are taking part in a series of exercises, alongside thousands of personnel from dozens of participating nations. 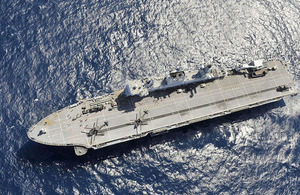 HMS Ocean carries Army Apache attack helicopters for firing exercises. HMS Ocean, which will take on the role of Flagship of the fleet from next week, will deploy on Exercise Baltops 2015 along with HMS Iron Duke and HMS Quorn in June. From early June, UK military personnel will be deployed to Eastern Europe and the Baltic states to take part in a series of military exercises. Collectively named Allied Shield, the four exercises will see thousands of personnel from NATO member and partner nations come together to practice conducting joint operations, while demonstrating NATO’s commitment to collective defence. The UK is taking part in two of the Allied Shield exercises, Baltops and Saber Strike. Baltops is an annual maritime and amphibious warfare exercise led by the US, taking place in the Baltic Sea and around the coast of Poland. Beginning on June 5th it will involve nearly 4500 personnel, 47 ships, and 49 aircraft from 17 nations, including a 700-strong amphibious landing force. The exercise will practice a range of capabilities, including anti-surface, anti-air and anti-submarine warfare, mine countermeasures, and amphibious landings. Leading the UK contribution to Baltops, the Royal Navy will deploy HMS Ocean, a helicopter carrier, and HMS Iron Duke, a Type 23 frigate. HMS Quorn, a mine hunting vessel, will also be deployed in its role as part of a NATO mine clearance group. Navy and Army helicopters operate from HMS Ocean, and a detachment of Royal Marines will take part in amphibious landing operations alongside their Finnish, Swedish, and American counterparts. At the same time, soldiers from the British Army will take part in Exercise Saber Strike, conducted in Poland and the Baltic states of Lithuania, Latvia, and Estonia. Another annual US-led exercise which has been linked to NATO, Saber Strike 2015 will bring together 3000 personnel from the host nations and allies to conduct joint infantry and close air support exercises. Around 170 UK soldiers will take part in Saber Strike from June 8th, including the Battle Group Headquarters and a company from 2nd Battalion, The Royal Gurkha Rifles. The exercise is designed to enhance interoperability and military cooperation, in preparation for future joint operations as part of the NATO Response Force and, in time, the Very High Readiness Joint Task Force (VJTF). The key role that our armed forces will play in the Allied Shield exercises clearly demonstrates our commitment to defending our NATO allies and partners. Operating alongside other nations’ forces on land, sea, and in the air, we are able to enhance our ability to conduct joint operations now and in the future, and respond to any threat to the Alliance. These exercises are just the latest examples of the UK’s ongoing contribution to the reassurance, training, and defence of our Eastern European NATO allies. Following the deployment of RAF Typhoons on the Baltic Air Policing mission, and the Army’s participation in Estonia’s largest ever military exercise earlier this month, the UK will continue to play a key role in the collective defence of NATO countries. The participation of British forces in the Allied Shield exercises is part of the UK’s contribution to NATO’s Assurance Measures, which came into being in May 2014 and form part of the NATO Readiness Action Plan (RAP). The RAP provides a comprehensive package of necessary measures to respond to changes in the security environment on NATO’s borders and further afield that are of concern to Allies. The UK’s contributions to NATO assurance measures, including exercises in Eastern Europe, will continue throughout 2015 and beyond.